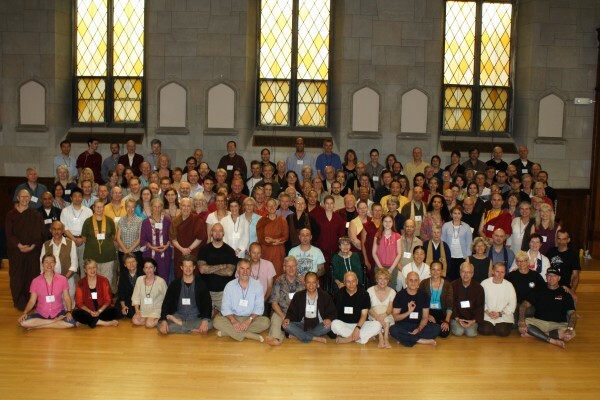 In November 2009 I was surprised to receive an invitation to a Buddhist teachers conference to be held at the Garrison Institute, New York, June 2011, because I’m not really much of a Buddhist practitioner let alone teacher. However, casting authenticity to the winds, I humbly accepted. Key themes were to include The Mindful Society, a visionary consideration of the promise and the pitfalls as the Dharma spreads more widely into medicine, science, healing, education, the arts and all aspects of Western culture; Preservation of Depth and Adapting Skillful Means to a New World, how to preserve and adapt the Dharma in new conditions without losing depth; and From Elders to the Next Generation, an invitation of 50 young teachers (ages 30-44) to join the council to consider together how the current teachers can best support and empower the next generations. By the time the meeting rolled around, a couple of our teachers – Ven. Connie Miller and Don Handrick – had also been invited. Lama Zopa Rinpoche declined fairly early in the process and Yangsi Rinpoche canceled closer to the meeting. There were very few Tibetan teachers there – my old friend Gelek Rinpoche being a notable exception – and when I asked the organizers why this was they said the main reason was that accommodation was limited and they wanted most of it to be used by teachers attending the conference, and many of the Tibetan lamas would not come without their entourages! There were, of course, many of the rock star Dharma writers and teachers there – Lama Surya Das, Joseph Goldstein, Stephen Batchelor, Jack Kornfield, Jon Kabat-Zinn, Bhikkhu Bodhi and Norman Fischer to name a few – but most of the teachers were relatively unknown to each other and it was a wonderful opportunity to meet so many colleagues from traditions across the board and many of the younger Dharma teachers, such as the much-tattooed Dharma Punx. There were also a couple of FPMT-connected teachers there – Sylvia Wetzel and Jan Willis. I found the meeting itself somewhat unsatisfying. The discussion was kind of vague and general and I didn’t find any real conclusions drawn. Nevertheless, it was a good thing to bring all these fine people together even if the main result was simply that we met each other. Buddhadharma magazine published an extensive article on the Garrison Institute conference in the Fall 2011 edition.